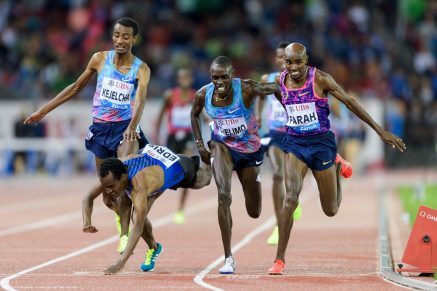 24th August 2017 – If ever one race exemplified everything that made Sir Mo Farah (GBR) a ten times global champion it was his final ever track race at the IAAF Diamond League Final in Zurich. Racecraft, determination, and no shortage of closing speed were all needed again in a dramatic four-way surge for the line in the 5000m. Once more it was Mo who came out on top holding off all his closest challengers to win his first Diamond League title. Dina Asher-Smith (GBR) combined with her World Championships 4x100m silver medallist teammates to finish second again here, narrowly being pipped by Jamaica on the line. Vincent Kibet (KEN) was again competitive to the end in the men’s 1500m final. He took sixth place with training partner Bethwel Birgen (KEN) in eleventh.